Will Europe Embrace Hybrid Wine Grapes? Floreal is one of four new disease-resistant varieties released by Institut National de la Recherche Agronomique. Geneva, N.Y.—It’s a curious fact that the wine world, from producers to consumers, divides its cultivars into “hybrids” (or interspecific hybrids) and vinifera. We don’t hear about hybrid apples or strawberries, so why do we insist upon making this distinction for wine grapes? This classification, of course, dates back to the phylloxera crisis in the mid-1800s, when panicked producers turned to both grape breeding and grafting to rescue the European wine industry. From the 1870s on, European grape breeders crossed vinifera cultivars with several American Vitis species to produce what became known as the “French-American Hybrids.” The success of this effort eventually resulted in 400,000 hectares (a little less than 1 million acres) under production in France. But the wine quality of some of the French-American hybrids proved to be disappointing, compared to traditional 100% V. vinifera cultivars. 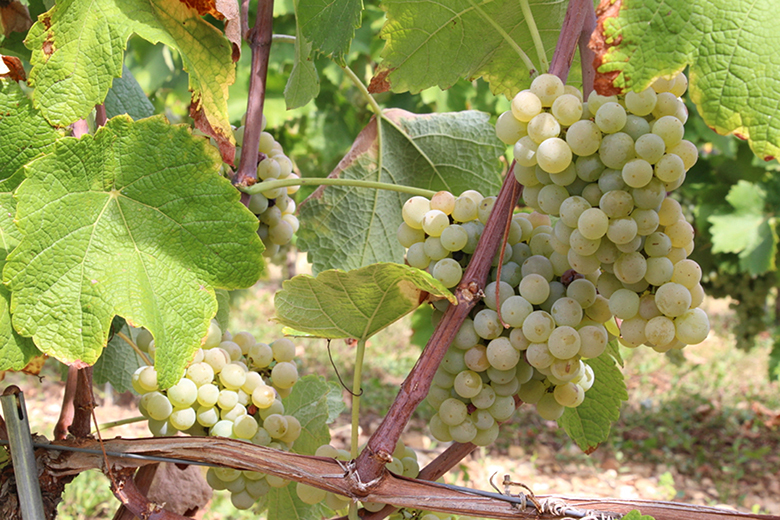 Early efforts used lower-quality vinifera parents such as Aramon (a widely planted bulk wine variety) rather than more elite varieties as parents. This helped put the French wine industry back on its feet but also resulted in a long-lingering taint to the reputation of wines made from interspecific hybrids. Simply put, hybrids didn’t get much respect. The other solution — grafting vinifera scions to phylloxera-resistant American Vitis rootstocks — won out. As the use of rootstocks took hold, France progressively increased regulations to discourage use and replanting of the French-American hybrids, effectively prohibiting replanting by the early 1970s. By 2010, the area planted to French-American hybrids had declined to 6,000 hectares, a minuscule 0.8% of the 785,000 hectares in France. Many French-American hybrids made their way back across the Atlantic to North America, starting in the 1940s, and were widely planted in Eastern production areas by the 1970s. They provided Eastern producers with an alternative to traditional labrusca-based wines. Not only were they resistant to phylloxera, but some also offered enough cold-hardiness to survive the cold winters, some measure of disease resistance, and flavor profiles that were different from those of labrusca wines. But their second-class status has persisted. Better fungicides and improved cultural practices have allowed Eastern growers to plant and vinify V. vinifera varieties successfully. Since the 1980s, production of classic vinifera wine cultivars in Eastern North America has blossomed, and their production has raised the profile of wine regions from New York to Virginia, Ohio, Michigan and Ontario. Ontario’s Vintner’s Quality Alliance (VQA) program has mirrored France’s approach by prohibiting the use of French-American hybrids in VQA wines. With the exception of Baco Noir, Chambourcin, Chancellor, Couderc Muscat, Marechal Foch, Seyval Blanc, Vidal Blanc and Villard Noir, all other hybrids are excluded from VQA labeling. Meanwhile, despite industry and regulatory resistance to hybrids, breeding programs in Europe and the United States have persisted, and their long-term efforts are finally bearing fruit. Varieties incorporating multiple disease-resistance genes are gaining traction. Europe is starting to embrace hybrids. Environmental, health and cost concerns are leading producers to reconsider hybrids. First and foremost is concern over the need for intensive use of fungicides to control diseases. A 2003 report of the European Union commission estimated that “viticulture uses 40% of the crop protection products in the whole of agriculture.” The French government’s “EcoPhyto” plan, launched in 2008, set a goal of reducing pesticide use 50% by 2018. This has placed pressure on French wine producers to reduce their reliance on fungicides. Second, vineyards are embedded in the very fabric of rural communities across France. A well-publicized event in Bordeaux, where several schoolchildren fell ill due to suspected pesticide poisoning, led to legislation empowering local authorities to restrict spraying at certain times of day near houses or public buildings. Finally, there are practical concerns about the cost of pesticides, fuel and labor needed to apply up to 15 sprays during the growing season. In a 2009 revision, the European Union relaxed regulations prohibiting hybrids. The highest classification (Protected Designation of Origin, or the French acronym AOC) requires V. vinifera varieties, but hybrids crossed with V. vinifera can be used in the next level (called Protected Geographical Indication). In May 2016, France opened its official catalog of varieties to new temporary registrations, including experimental plantings of “distinct, uniform and stable” hybrids. This allows plantings of up to 20 hectares at 10 locations. This past year, the French National Research Institute’s (INRA) ENTAV unit, responsible for foundation plantings and distribution of approved clones and varieties, released four new disease-resistant varieties. Two reds (Artaban and Vidoc) and two whites (Floreal and Voltis) are now available in the official ENTAV catalog. All four — produced by conventional cross-breeding — have two powdery mildew (denoted Run1 and Ren3) and two downy mildew (Rpv1 and Rpv3) resistance genes. INRA recommends that producers apply fungicides two to three times per year to protect the resistance genes and to control secondary diseases such as black rot. Contrast this to the 10 to 15 sprays made to susceptible cultivars such as Chardonnay. Independently, a producer group called PIWI (German acronym for "Pilzwiderstandsfähig," which means “able to resist fungi”) is devoted to “dissemination of fungus-resistant grape varieties.” It has 350 members from 17 European and North American countries, some of whom have private breeding programs. Among them is the Domaine La Colombette in the Languedoc region of France, which has 15 hectares planted to experimental varieties in a “no-spray” block with names like Cabernet Noir and Cabernet Blanc. The company recently released a wine called Metissage produced from this vineyard. It won’t be eligible for AOC labeling, and must be clearly labeled as experimental under French regulations. Small start, but emerging trend? These efforts represent the proverbial drop in the bucket, at least in Western Europe, where an estimated 31,400 of 2.7 million total hectares are planted to hybrids, which is a little more than 1%. In Eastern Europe (e.g., Romania, the former Soviet Union, Hungary, the former Yugoslavia and Bulgaria), about 225,000 hectares are estimated to be planted, accounting for 22% (Bulgaria) to 47% (Romania) of total production. The distinction between hybrid and vinifera is becoming less and less useful. Where early grape breeders were once satisfied with productivity, lack of labrusca flavor notes and phylloxera resistance, current programs are using elite cultivars with excellent wine quality as parents along with lines carrying known disease resistance verified through DNA testing. Newer varieties are becoming more and more vinifera-like. This fact has led Germany to classify certain varieties as V. vinifera, in spite of their incorporation of North American Vitis spp. germplasm. Regent, an interspecific hybrid resulting from Diana (vinifera) and Chambourcin (hybrid), was approved for Qualitätswein in 1996 and is classified in all German growing regions as equivalent to V. vinifera. The regulatory approach taken was that Regent vines are indistinguishable from vinifera, and the wines taste like vinifera, so therefore it should be classified as a vinifera variety. Maybe it is time to stop calling them hybrids and start calling them “the disease-resistant varieties,” which is what a catalog from Italy’s largest nursery, Vivai Cooperativi Rauscedo (VCR), does. This description places a more proper emphasis on the payoff these varieties offer to European viticulture: the ability to dramatically reduce the number of fungicide sprays needed to produce a marketable, high-quality crop. While widespread acceptance is uncertain at this point, it is clear that among at least a small group of producers the disease-resistant varieties have found a niche, and the market for low-input, sustainably produced wines will likely grow over time. Hybrids, scorned in Europe since the 1950s, may again see increasing acceptance as consumers realize the environmental benefits and higher wine quality that the new disease-resistant hybrid varieties offer. Dr. Tim Martinson is senior extension associate and Dr. Bruce Reisch is professor in the Horticulture Section of the School of Integrative Plant Science at Cornell University, based at Cornell-Agritech in Geneva, N.Y. In the new Danish BOB even Regent. a old hybrid with poor quality, is allowed. It is a political powerstugle between Germany selling hybrids and Italy opposing these inferior grapes.